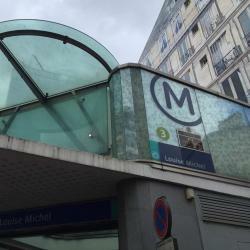 Looking for hotels near Anatole France Metro Station? Located just in Levallois-Perret, just outside of the center of Paris, Résidence Courcelle offers self-catering accommodations with a flat-screen TV. Featuring city views, L'Art Déco is located in Neuilly-sur-Seine, 1.7 miles from Bois de Boulogne. Free WiFi is featured. The bed and breakfast has a terrace. Hotel Boris V. by Happyculture is located in Levallois-Perret, 3.7 mi from La Défense business district and 1.2 mi from Porte Maillot Convention Center. Located 2.5 mi from La Défense and 1.9 mi from the Arc de Triomphe, Crowne Plaza Paris Neuilly is also 0.9 mi from Palais des Congrès de Paris. Clean rooms, good bathroom products. The Briand 3-star hotel is close to central Paris, 15 minutes from Place de l’Etoile, the Champs-Elysées, Palais des Congrès and La Défense business district. Clean, comfortable bed. Far from Metro station, but RER across street. Far from a market. One mile from the Palais des Congrès, this hotel offers soundproofed and air conditioned rooms with free Wi-Fi. Parc Monceau is a 15-minute walk away. Very good position of the hotel. Nice and friendly staff. Very nice, pleasent room. Featuring a terrace and free WiFi, Au limousin is located in Levallois-Perret, a 3-minute walk from CELSA and 0.6 miles from SAP Headquarters France. This 2-star hotel offers luggage storage space. The cleaning was ok, it's in a good place in Levaillois.